Protect Your Company’s People, Products, Property & Brand at All Times. Mission-critical security ensures maximum 24-hour protection as authorized personnel enter and exit your property. MADI's senior security team leaders are highly experienced in managing threats and reducing the risks of a labor dispute. Gain advantage over striking workers with our specially trained teams of NLRA-compliant Evidence Specialists. Established long-term relationships with your workforce can be turned upside down during a labor dispute. Union workers, who under normal circumstances are valued employees, become adversaries who often will attempt to use any and all means they can disrupt operations and attack the reputation of the company if they believe it will help them achieve their goals. Add to that, with tools such as social media and a global audience at their disposal, strikers have the ability to capture and disseminate potentially compromising audio and video images in an instant at the push of a button. In this complex environment, it is essential that you maintain leverage and avoid costly charges of unfair labor practices, and be prepared to legally document verifiable union violations that can be used in court to your advantage. This is where MADI Protection comes in. Whether you need to protect one (1) or multiple sites in multiple geo-locations at the same time, MADI Protection can secure all locations 24-hours per day, seven-days-a-week until such time as an agreement has been reached and normal operations resume. Experienced MADI personnel are specially trained to identify and protect vulnerable areas on and off site, and establish a deterrent security presence in order to prevent vandalism, injury and unauthorized access to the facility. MADI Security Teams are highly trained professionals, many with years of front-line experience in Labor Dispute environments, and well versed in the National Labor Relations Act (NLRA). Discourage picketing individuals from committing unlawful acts. Document union misconduct to support requests for Temporary Restraining Orders, in compliance with the National Labor Relations Act (NLRA). Maintain evidence within a verifiable chain of custody. Provide Evidence in court-admissible formats, to support requests for temporary restraining orders. Our protection personnel are seasoned professionals with documented experience in strike security in addition to prior military/law-enforcement experience. Guards without a military/law enforcement background possess years of documented prior security experience in the strike industry and must provide multiple professional references in order to be considered. 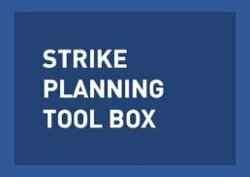 Do You Need Help With Strike Planning or Strike Security? Remote Analysis: This is a free service where our experts conduct a Site Review using satellite imagery via teleconfernece. Protection Resources Plan: MADI's senior protection experts conduct an on-site analysis of your facility to identify specific physical vulnerbilities and staffing recommendations. Deployment: Teams of Evidenced Specialists and Supervisors are deployed to protect your People, Property, Products and Brand at all times. Staff Training: Team leaders can provide training and briefings on picket line proceedures and other useful security procedures for non-bargaining unit personnel and executives. When you partner with MADI's team of professionals who are dedicated to protcting your interests in the event of a work stoppage or strike. MADI's reputation is built upon our ability to maintain Business Continuity for our unionized clients anywhere in the US by placing the right strike replacement workers in the right jobs, within 24-48 hours when readiness option is chosen, and and protecting your people, property, products and brand at all times. The result of teaming with MADI will be the successful continuation of operations and managing risks despite the additional threats a work stoppage poses.